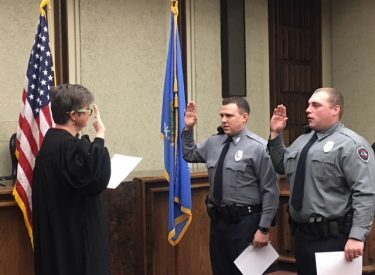 Assistant Municipal Judge Paige Lee administers the Oath of a Police Officer for two new Ponca City Police Officers. Pictured here are Judge Lee, Kevin Hamby and Dakota Tomlinson. Hamby, a graduate of Sand Springs High School, joined the United States Navy in 2002 and was honorably discharged in 2011. Hamby most recently served as a deputy for the Craig County Sheriff’s Office. He was the former Assistant Chief for the Chelsea Police Department and served two years with the Pawnee Police Department. Hamby was a Council on Law Enforcement Education and Training (CLEET) graduate in 2014. Tomlinson is a graduate of the CLEET academy in 2016. He was also a former Craig County Sheriff’s deputy in Vinita, OK. Prior to becoming a deputy, Tomlinson was a reserve deputy and was a correctional officer for Craig County. He was an employee of the Oklahoma Corporation Commission for three and a half years and served as a Motor Vehicle Enforcement Officer.